Having recently learned of the death of a wonderful college administrator, colleague, professor, leader, musician, Christian, mentor, and friend, Dr. Phillip Santa Maria, I have been moved to write this tribute to him. Sadly, not having previously known of his passing shows how out-of-touch I have been about people and activities at the State University of New York College at Buffalo, my alma mater. I recently sought to reconnect with Dr. Santa Maria through LinkedIn, and was informed by another administrator at the college of his passing. Dr. Santa Maria was Associate Vice President for Student Affairs and Dean of Students at the State University of New York College at Buffalo – or Buffalo State College – in Buffalo, New York. I had the privilege of meeting and knowing Dr. Santa Maria through my studies in the Master’s Degree Program in College Student Personnel Administration, offered at the college. Attending the college and earning my degree in 1997, I again returned there in 1999-2000 to earn my secondary social studies teaching certificate. Throughout both periods of my attendance at Buffalo State College, I met and got to know Dr. Santa Maria on a professional level. During the time that I was studying for my graduate degree, I was interested in completing an internship with Dr. Santa Maria, though he already had one or two interns working with him at the time. Returning to the college, later, to earn my teaching certification, I was determined to make myself known to Dr. Santa Maria. His wonderful secretary, colleague, and friend, Nancy Terreri, initially arranged a time in which he and I could meet. 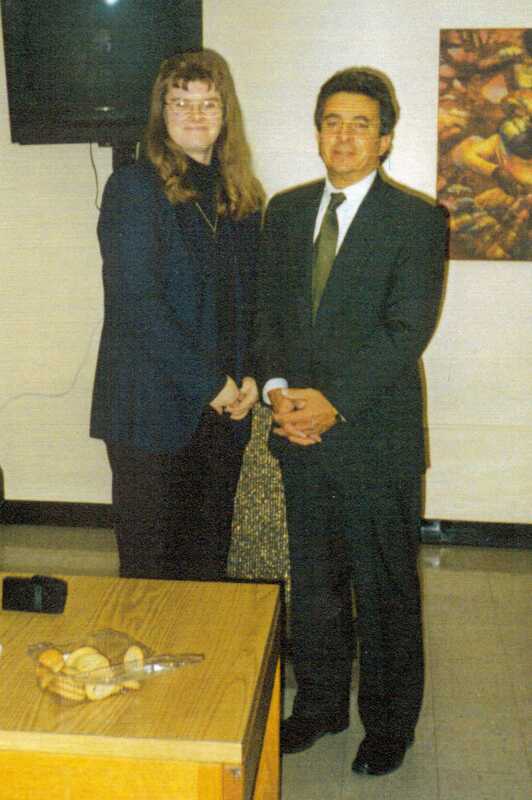 He and I, then, mutually decided upon a way in which we could work together – through collaborating on the “Issues of Interest” Series, a collection of articles that I wrote through interviews with him for the college newspaper, The Record. As I sit here and type this, I cannot help but cry in remembering Dr. Santa Maria. In everything that he did, “Dr. Phil,” as some of us jokingly called him, exemplified the utmost and highest possible professionalism. Dr. Santa Maria was that rare and unique person whom one meets and knows in his or her life who makes a positive difference in everything that he does. He was a man of the greatest humility, ethics, and morals; highest intelligence, competence, and standards; and most outstanding dignity, integrity, and respect. Dr. Santa Maria led by example. He was a man, leader, and role model who was open to people of all backgrounds, religions, races, ethnicities, and religions. Dr. Santa Maria was the professional of all professionals. Anyone whom Dr. Santa Maria met and with whom he interacted, he touched their lives in profound and wonderful ways. The talents and skills of Dr. Santa Maria went beyond his office and boundaries of the college. Dr. Santa Maria was a well-known Russian historian, had visited Russia, and led educational tours of Russia. He was a professor in the College Student Personnel Program, and taught classes in the program when called upon. He was a guitarist in his band that played classical guitar music throughout Western New York and in Canada. I was privileged to hear him play guitar with his band on two occasions, and brought my family to hear him play, as well. Dr. Santa Maria was always interested in the progress of the college and activities of the students. I was a senator in the United Students Government at the college, and Dr. Santa Maria and I would sit and discuss some of the contemplations, plans, and activities of the group. Beginning as a writer and columnist for the college newspaper, The Record, Dr. Santa Maria provided me with many hours of his time over the course of one year, in interviews about issues that were of interest to students and others at the college. I, then, fashioned those interviews into articles for the newspaper, calling them the “Issues of Interest” Series, a title mutually decided upon by both of us. As Dr. Santa Maria and I collaborated for the “Issues of Interest” Series, we got to know and trust each other more. When something came up and I had a couple of questions about sensitive issues at the newspaper office, I called him for his advice and guidance. Dr. Santa Maria also placed much trust and confidence in me, as well, in inviting me to sit on the Student Judicial Appeal Board and hear cases of fellow students. This wonderful college leader further elevated me by inviting me to participate in the Faculty and Staff Committee on Alcohol and Other Substance Abuse as a student representative. In regard to this Committee, Dr. Santa Maria was the Chairperson, and desired to spread awareness about the seriousness of alcohol and drug misuse and abuse on college campuses throughout the country. I can still hear Dr. Santa Maria now with his 1999 statement to me, “Students have certain freedoms, but with those freedoms come responsibilities.” Dr. Santa Maria always desired for students to be good and intelligent citizens who were responsible for their actions. Yet again, Dr. Santa Maria continued his trust and confidence in me by inviting me to the annual dinner of the Buffalo Council on World Affairs, as one of a few student representatives of the college. There, my horizons were expanded more still by hearing the speaker address the audience about important world social issues, as well as those affecting our local area. As a member of the student government, I was also one of a few college student representatives to attend SUNY Day in Albany – an opportunity for college student leaders to visit the state’s capital and speak with state government representatives. It was there that I met several state government leaders, including the Hon. Sam Hoyt, New York State Assembly Member for Buffalo, and was invited by him to intern in his office. I believe that it may have been due to the professional reputation that Dr. Santa Maria had provided me in developing that led to yet another wonderful experience in interning with Assembly Member Hoyt. On one occasion while meeting with Dr. Santa Maria in his office for an interview, he was conducting a conference call with University Police Lieutenant Sam Lunetta, giving me the privilege of introducing me to him and listening to their conversation about campus safety. Dr. Santa Maria and Lieutenant Lunetta regularly communicated with each other about happenings on campus related to public safety. Lieutenant Lunetta performed his work remarkably, which I shared with Dr. Santa Maria. Dr. Santa Maria asked me if there was anything that I thought could be improved regarding campus safety. As I was unable to think of anything, I responded to him that I believed they had all the bases covered. In encouraging everyone on campus to be safe, using the Blue Light system, having parking lot bussing to the main part of campus, and a visible presence of public safety officers on campus, Dr. Santa Maria and Lieutenant Lunetta did their best to make sure that everyone on campus was safe at all times. Through Dr. Santa Maria’s introduction to me of Lieutenant Lunetta, I also interviewed him for a newspaper article on student drinking and thoughts about potential parental notification regarding it. Dr. Santa Maria also encouraged me to meet and interview many other administrators, leaders, professors, and students at the college for the “Issues of Interest” Series, as well as to report on the “Great Decisions” Lecture Series on campus, which I did. Working with Dr. Santa Maria on this basis expanded my horizons and provided me with a broader knowledge of issues affecting college campuses. As a person of high expectations, ethics, morals, standards, and values, Dr. Santa Maria brought out the best in everyone. This was no different with me – he brought out the best in me. The more I interacted with him, the more I had the desire to excel and succeed, and to please him, professionally. The professionalism, integrity, and energy with which Dr. Santa Maria continually worked and led his life were a huge inspiration for me. Dr. Santa Maria had that gentle, caring, sensitive, and soft-spoken way about him that reached my heart and my soul. It was as if he reached in and provided comfort and peace to my heart. Talking with him, seeking his advice, and receiving his professional and personal guidance brought me a profound sense of calmness and trust in him. We always conducted ourselves professionally and respectfully toward each other, and this provided the foundation for our trust and confidence in each other. On occasion, Dr. Santa Maria and I discussed personal issues that presented concerns to us. I remember asking him what his thoughts were about whether or not I should move out-of-state to accept employment in teaching. I shared with him that I was afraid to do so; he told me not to be afraid. And, in telling me that, he had a way of comforting me that convinced me that everything would be okay. At one time, Dr. Santa Maria shared with me that he had considered taking work in a warmer part of the country, namely Florida, because he had just been there for a professional conference. I stated to him that everyone at the college needed him, and I asked him what everyone would do without him. He accepted that, though I am not sure that is the answer he was looking for. Dr. Santa Maria silently managed his career stresses every day, working extremely long hours, arriving very early and sometimes, going without lunch and dinner in order to complete his work. He handled his professional stress with so much humility and acceptance. He was a man who loved what he did, professionally, and was the best at it. He was also a man, who, in my observations, was deserving of more credit and respect for his work from his superiors, though he would never breathe a word about it. I once accompanied Dr. Santa Maria to a board meeting of higher level administrators, and observed him sit quietly while others spoke. It was then that I noticed that his work and accomplishments should have been more appropriately recognized by his superiors. Dr. Santa Maria was an excellent listener, as well as an outstanding communicator. I personally wished that he was able to serve in a position of even higher leadership at the college as his professionalism and sensitivity would have reached even further than it already has. It was at this particular board meeting that Dr. Santa Maria introduced me to several college leaders, some of whom I had already met and others whom I had not. There, he introduced me to Vice President for Student Affairs Hal Payne and International Student Affairs Director Jean-Francois Gounard, and some others. I was also re-introduced to President Muriel Moore, whom I had previously known as a student at the University of Buffalo. Yet, again, Dr. Santa Maria provided me with another opportunity to network, and build and develop my professional experiences and reputation. Dr. Santa Maria’s introduction of me to Dr. Gounard provided another professional friendship that developed while I was a student at Buffalo State College. Dr. Gounard invited me to his offices, gave me a tour of them, and explained what services were provided there. I shared with Dr. Gounard that I had studied abroad in Krakow, Poland through the University at Buffalo, and had independently traveled throughout Eastern and Western Europe, the British Isles, and Canada. Dr. Gounard invited me to write an article for the International Student Affairs newsletter about my travels, which I did, while also providing an accompanying photograph. Dr. Gounard further invited me to attend a professional luncheon that welcomed to Buffalo a fellow Frenchman, Phillip Jenkinson, who spoke there and who was very successful in business. Thus, Dr. Santa Maria provided me with an experience of developing a positive relationship with another of his trusted colleagues. Dr. Santa Maria, being a person who was open to meeting, and networking and communicating with everyone, also allowed me to introduce him to a successful business leader and entrepreneur whom I knew from my hometown. This business leader – now semi-retired – was the head of a successful sand, gravel, and asphalt company that has nine large business enterprises throughout Western New York and Eastern Pennsylvania. Providing leading professionals with an opportunity to connect was important to me, as well as to Dr. Santa Maria, since one of my main interests in college administration is in career development. On another note, Dr. Santa Maria was an avid walker, and would walk late in the evenings after returning home from work, as he shared with me. I was always happy that he was able to relieve some of his work stresses through exercise and other activities that he enjoyed, such as playing his guitar. He and I had something in common in relation to these activities since I also enjoy walking and jogging, as well as having played piano and clarinet. It is important for people to have recreational and creative outlets. I could reflect upon some of Dr. Santa Maria’s life, though I only became aware of so much more of what he did in his life following his death. Dr. Santa Maria was a person who was so focused on his work and the current events occurring in his life that the past was not something that we often discussed. Dr. Santa Maria once shared with me that he worked the night shift at the Bethlehem Steel Plant in Lackawanna, New York while he was attending college. He was proud that he worked his way through college with employment in the steel industry. He and I also spoke of our families, and he shared with me about his daughter and son, as well as their studies and hopes for the future. The best way to remember Dr. Santa Maria in tribute is to recall and reflect upon the person whom he was. Dr. Santa Maria is the epitome of a man – a professional, a leader, a fellow Catholic and Christian, and a true gentleman. He is the type of man that all men should aspire to be. He was a true reflection of a man among men. As the tear stains have now dried upon my face, though my eyes are welling up again, I remember Dr. Santa Maria and the man whom he was. Dr. Santa Maria was and is a man whose spirit touched the lives of so many people in such wonderful ways. My tribute and description here pale in comparison to the person whom he was. I am so honored, privileged, and blessed to have known Dr. Phillip Santa Maria, to have him as a colleague, friend, and mentor. One would be truly blessed to have met Dr. Santa Maria or even one like him throughout their entire lives. He continues to serve as a role model and inspiration to me, professionally and spiritually. Please consider making a financial contribution to the Dr. Phillip Santa Maria Memorial Fund through the Buffalo State College Foundation. Monies contributed in this fund are awarded as scholarships to outstanding students at Buffalo State College. *Note: This article has been posted twice since online searches for it were providing error results.